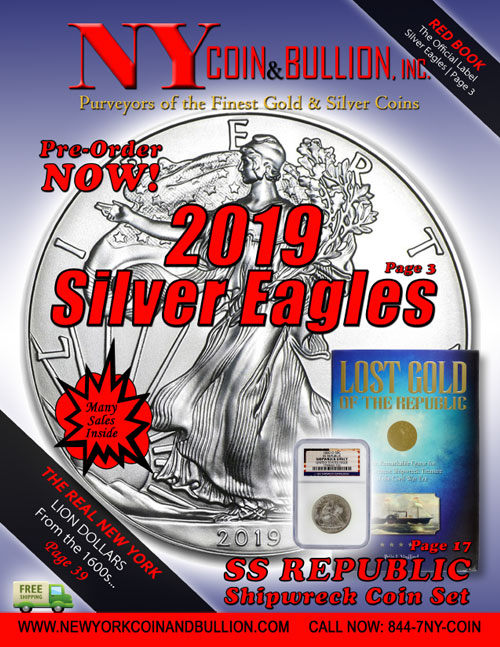 New York Coin and Bullion, Inc. ("NYCB") respects your privacy. We will never willfully disclose individually identifiable information about our customers to any third party, except in the limited circumstances permitted by this policy. NYCB does not sell, rent, or loan any personally identifiable information regarding its customers to any third party. Any information you give us is held with the utmost care and security, and will not be used in ways to which you have not consented. The Sites may ask you to provide information that could reasonably be used to contact you or to identify you personally (such as your name, e-mail address, telephone number, or home address (“Personal Information”)). For example, NYCB may collect Personal Information when you register on the Sites, request information, submit comments or participate in some promotion, survey or other feature of the Sites, or otherwise communicate or interact with us. The Sites may also ask you to provide other information about yourself, such as demographic information (gender, zip code, age, etc.) or certain information about your preferences and interests. If we combine demographic or other information we collect about you with Personal Information about you, we will treat the combined information as Personal Information. To the extent the Sites allows you to apply to become a customer of NYCB, additional information may be requested and collected from you via customer application forms and other forms. If you do not want your Personal Information collected, please do not submit it. Whenever you visit or interact with the Sites, NYCB, as well as any third-party advertisers and/or service providers, may use a variety of technologies that automatically or passively collect information about how the Sites are accessed and used (“Usage Information”). Usage Information may include, in part, browser type, operating system, the page served, the time, and the preceding page views. This statistical data provides us with information about the use of the Sites, such as how many visitors visit a specific page on the Sites, how long they stay on that page, and which hyperlinks, if any, they “click” on. This information helps us keep our website fresh and interesting to our visitors and tailor content to a visitor’s interests. Usage Information is generally non-identifying, but if NYCB associates it with you as a specific and identifiable person, NYCB treats it as Personal Information. NYCB also automatically collects your IP address or other unique identifier (“Device Identifier”) for the computer, mobile device, technology or other device (collectively, “Device”) you use to access the Sites. A Device Identifier is a number that is automatically assigned to your Device when you access a website or its servers, and our computers identify your Device by its Device Identifier. § Cookies are data files placed on a Device when it is used to visit the Sites. NYCB, or our third-party advertising service providers, may place cookies or similar files on your Device for security purposes, to facilitate site navigation and to personalize your experience while visiting our Sites. Cookies allow us to collect technical and navigational information, such as browser type, time spent on our Sites and pages visited. Cookies also allow us to select which of our advertisements or offers are most likely to appeal to you and display them while you are on the Sites. If you would prefer not to accept cookies, you can change your browser settings to notify you when you receive a cookie, which lets you choose whether or not to accept it; or set your browser to automatically not accept any cookies. However, please be aware that some features and services on our Sites may not work properly because we may not be able to recognize and associate you with your NYCB account(s). In addition, the offers we provide when you visit us may not be as relevant to you or tailored to your interests. § A pixel tag is a transparent graphic image, sometimes called a web beacon or tracking beacon, placed on a web page or in an email, which indicates that a page or email has been viewed. In addition, a pixel tag may tell your browser to get content from another server. In order to ensure the safekeeping of your information, network advertising companies and publishers are not permitted to directly collect Personal Information on our Sites. NYCB has implemented and uses Google Analytics for Display Advertisers and Google Display Network (DoubleClick). Google Analytics collects anonymous data about your interaction with our website via the DoubleClick cookie and through the standard Google Analytics implementation. Anonymous data may be used for purposes including delivering to you banner advertisements and other advertising tailored to your interests when you visit certain websites and selecting offers and products to display to you when you visit our website. NYCB uses the information we collect about and from you for a variety of business purposes, including for example, to: respond to your questions and requests; provide you with access to certain areas and features of the Sites; verify your identity; communicate with you about your account and activities on the Sites and, in our discretion, changes to any NYCB policy; tailor content, advertisements, and offers we serve you; improve the Sites and for internal business purposes; process applications and transactions; and for purposes disclosed at the time you provide your Personal Information or otherwise with your consent. In order to carry out your requests, to make various features, services and materials available to you through the Sites, and to respond to your inquiries, we may share your Personal Information, or Usage Information with third parties that perform functions on our behalf (or on behalf of our partners), such as companies or individuals that: host or operate our Sites; analyze data; provide customer service; advertisers; sponsors or other third parties that participate in or administer our promotions or provide marketing or promotional assistance (such as in connection with winner selection, prize fulfillment, and as required by law, such as on a winners list). Your Personal Information may also be used by us or shared with our subsidiaries, affiliates and other entities in the family of companies controlled by NY Coin and Bullion, Inc. for internal reasons, primarily for business and operational purposes. As we continue to develop our business, we may sell or purchase assets. If another entity acquires us or all or substantially all of our assets, or assets related to the Sites, Personal Information, Usage Information, and any other information that we have collected about the users of the Sites may be disclosed to such entity as part of the due diligence process and will be transferred to such entity as one of the transferred assets. Also, if any bankruptcy or reorganization proceeding is brought by or against us, all such information may be considered an asset of ours and as such may be sold or transferred to third parties. NYCB may transfer and disclose information, including your Personal Information, Usage Information and Device Identifier (including IP address), to third parties to comply with a legal obligation; when we believe in good faith that the law requires it; at the request of governmental authorities conducting an investigation; to verify or enforce our User Agreement or other applicable policies; to respond to an emergency; or otherwise to protect the rights, property, safety, or security of third parties, visitors to our Sites or the public. NYCB may receive information about you from third parties. For example, if you are on another website and you opt-in to receive information from NYCB that website will forward to us your e-mail address and other information about you so that we may contact you as requested. You may also choose to participate in a third party application or feature (such as one of our Facebook or Twitter applications or a similar application or feature on a third party website) through which you allow us to collect (or the third party to share) information about you, including Personal Information. In addition, we may receive information about you if other users of a third party website give us access to their profiles and you are one of their “connections” or information about you is otherwise accessible through your “connections” web page, profile page, or similar page on a social networking or other third party website or interactive service. You may always direct us not to share your Personal Information with third parties, not to use your Personal Information to provide you with information or offers, or not to send you newsletters, e-mails or other communications by: (i) sending us an e-mail at info@newyorkcoinandbullion.com with the word “Remove” as the subject header; (ii) calling us at (844)769-2646; or (iii) following the removal instructions in the communication that you receive. Your opt-out request will be processed within 30 days of the date on which we receive it. You can opt out of attribution modeling by clicking here. If you wish to verify, correct, or update any of your personal information collected through the Sites, you may edit your profile preferences or contact us at the above address or e-mail. In accordance with our routine record keeping, we may delete certain records that contain Personal Information you have submitted through the Sites. We are under no obligation to store such Personal Information indefinitely and disclaim any liability arising out of, or related to, the destruction of such Personal Information. In addition, you should be aware that it is not always possible to completely remove or delete all of your information from our databases without some residual data because of backups and other reasons. California law requires us to let you know how we respond to web browser Do Not Track (DNT) signals. Because there currently is not an industry or legal standard for recognizing or honoring DNT signals, we do not respond to them at this time. We await the result of work by the privacy community and industry to determine when such a response is appropriate and what form it should take. NYCB licenses technology to serve advertisements on its own Sites and within its content as that content is served across the Internet. In addition, NYCB may use third party network advertisers to serve advertisements and third party analytics vendors to evaluate and provide us with information about the use of the Sites and viewing of our content. We do not share Personal Information with these third parties, but ad network providers, the advertisers, the sponsors, and/or analytics service providers may set and access their own cookies, pixel tags and similar technologies on your Device and they may otherwise collect or have access to information about you, including Usage Information. We and our network advertisers may target advertisements for products and services in which you might be interested based on your visits to both the Sites and other websites. We may use a variety of companies to serve advertisements. Please note that even if you choose to remove your information (opt out), you will still see advertisements while you are browsing online. However the advertisements you see may be less relevant to you and your interests. Additionally, many network advertising programs allow you to view and manage the interest categories they have compiled from your online browsing activities. These interest categories help determine the types of targeted advertisements you may receive. The NAI Opt-Out Page provides a tool that identifies its member companies that have cookies on your browser and provides links to those companies. The Sites are not directed to children under 13. We do not knowingly collect personally identifiable information from anyone under 13 years of age. If we determine upon collection that a user is under this age, we will not use or maintain his/her Personal Information without the parent/guardian’s consent. If we become aware that we have unknowingly collected personally identifiable information from a child under the age of 13, we will make reasonable efforts to delete such information from our records. The Sites may contain links to other sites that we do not own or operate. This includes links from advertisers, sponsors and partners that may use our logo(s) as part of a co-branding agreement. We do not control, recommend or endorse and are not responsible for these sites or their content, products, services or privacy policies or practices. These other websites may send their own cookies to your Device, they may independently collect data or solicit Personal Information and may or may not have their own published privacy policies. You should also independently assess the authenticity of any site which appears or claims that it is one of our Sites (including those linked to through an email or social networking page). The Sites are operated in the United States. Given that we could potentially be an international business, our use of your information necessarily involves the transmission of data on an international basis. If you are located in the European Union, Canada or elsewhere outside of the United States, please be aware that information we collect may be transferred to and processed in the United States. By using the Sites, or providing us with any information, you consent to the collection, processing, maintenance and transfer of such information in and to the United States and other applicable territories in which the privacy laws may not be as comprehensive as or equivalent to those in the country where you reside and/or are a citizen.